Many years ago my uncle gave me a student study bible. It was in the New American Standard version. I did love that bible, but I didn’t take it to church because I had a lot to take with me since I started playing my clarinet at church. I would use the church’s bible. Then a few years ago I wanted to give a study bible like the one I had to my best friend for Christmas. I couldn’t find one that was New American Standard. I wanted to give her one that has maps and features in it. I couldn’t believe how much bibles nowadays. I saw one that I thought she would like, but the price was outrageous. On Black Friday that year(the day after Thanksgiving), I went to Lifeway (the Christian bookstore). They had that bible on sale for 10 dollars!! But it was the hardcover version. I really wanted to get her a personal size, but I couldn’t find one that was on sale for 10. So I got her the hardcover one anyway. After looking through it, I kinda wished I had gotten one for myself. Flash forward to this year, my uncle surprised my mother and me with two bibles. Guess what they were? The same bible I bought my best friend. The bible is the Holman Christian Standard Study Bible. A few months later, my best friend gave me a bible cover. So I can take my bible with me to church. A few weeks ago, I found out that the Holman Study Bible has a Kindle version. So I bought it last week. Now I can take my kindle to church and I feel carefree because I have less to carry. I put the kindle and my Sunday school book in my purse. I will be using that bible cover if I switch purses. The Bible can be your sanctuary like it is for me. 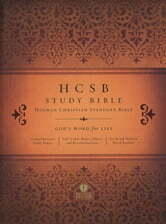 You can get the Holman Study Bible at Amazon.com (kindle version), Walmart.com, Kobo.com, or at Wordery.com.